A serving of Chicken Noodle Soup made with this recipe for the overnight staff at Holzer Senior Center in Gallapolis, Ohio, on January 12, 2019. 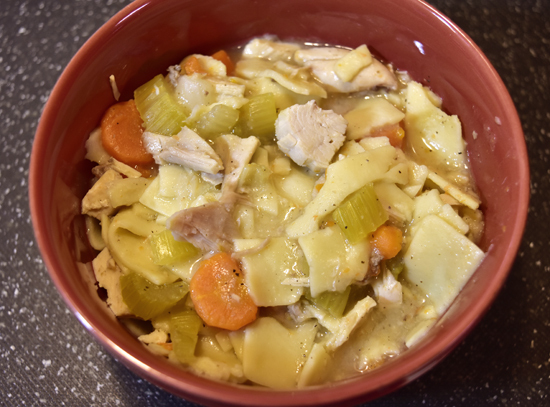 I had first posted my recipe for Traditional Chicken Noodle Soup on December 30, 2007. In the subsequent decade it’s been made numerous times at our house during chilly days and cold winters in Michigan. Our daughter Bree and I have also swapped out traveling the 45 miles to each other’s home to make it when the other has been too sick to make it for themselves. It’s also been made a few times for Mary’s nursing staff coworkers, as a special treat, as a winning item for some kind of staff activity, or as part of a potluck. It hadn’t been made in all of 2018 after Mary began working as a traveling nurse in April. But on January 12, 2019, the overnight nursing staff scheduled a “soup potluck” at Holzer Senior Center in Gallapolis, Ohio, where Mary is currently working. It was quite a hit, to the point where Mary’s coworkers requested the recipe. At that point it dawned on me just how much the recipe had evolved. I now had it down to a single pot, and it was richer than before if only because I was now cooking the noodles in the juices from the chicken. Cooking the noodles with the noodles was also a major timesaver. I wrote out the recipe by hand so Mary could make copies (we don’t travel with a printer), and present it here as well. Make sure the freshest ingredients possible, as well as using chicken stock instead of broth or boullion. Enjoy! Add 4 – 6 quarts water to a stock pot (enough to cover the chicken by about 3 inches) and salt well. Break down the chicken and add it and the giblets to the salted water. Stirring occasionally to prevent sticking, boil the chicken till fork-tender with no redness at the bone. Remove the pot from the heat. Remove the chicken from the water (discarding the giblets) and set aside to cool. Clean and slice the celery and carrots and do a large chop on the onions. When the chicken is cool enough to touch, skin and debone it, then cut it into bite-size pieces. Bring the pot back to a boil. Add the vegetables and the chicken stock, stir well and season to taste. Immediately add the noodles, then cook until the noodles are al dente. Remove from the heat and stir in the chicken. Serve. Note: The soup can be frozen in portions for reheating later. Macaroni & Cheese Loaf; Way or No Way?